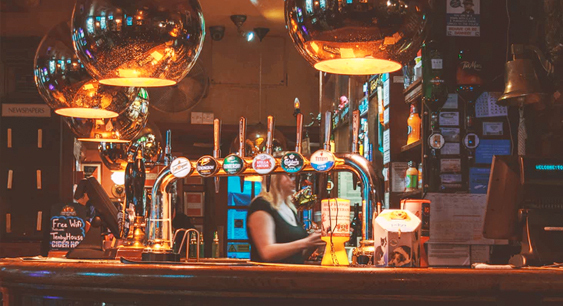 If you run a pub, you’ll be well aware of the risks involved – any venue in which alcohol is consumed not only comes with an increased likelihood of property damage and theft, but the potential for injury to both staff and customers is also amplified. While having the right pub insurance in place won’t help to avoid any situations that might put your staff, customers, property or even yourself at risk, it can offer the financial support in case you do find yourself facing unexpected costs following an unfortunate situation. Having cover in place with an insurer who works hard to uncover fraudulent claims that can potentially be brought by customers who slip, trip and fall, can help prevent damage to your reputation, too. What is insurance for pubs? Insurance for pubs isn’t technically a standalone product, but rather a package of cover designed to offer your business all the protection it needs against a range of risks, from theft to personal injury. Although the type of cover you take out will depend upon factors such as the size and location of your pub, its opening hours, and whether you live on site, there are certain policies that are likely to form the basis of any pub insurance package. As a pub landlord, you could be deemed responsible for a customer who has injured themselves - for instance by slipping on a spilled drink or wet toilet floor. If you are held liable you may have to defend against a compensation claim, in which case public liability insurance for pubs could cover the cost of any legal defence and third party charges. Just as you’ll need cover for the risk of customer injury, you’ll need insurance in place in case any of your employees are hurt while at work. It could be a glass collector cutting their hand on a broken bottle, or a bartender slipping on a spilled drink – whatever the reason, if a claim is made and you’re deemed responsible, having employers’ liability cover in place means you could receive financial support for legal costs or compensation. If you only employ close family members, you may not be legally required to have employers’ liability insurance in place, but may still want to have the cover in place. If you inhabit the pub, the responsibility for taking out buildings insurance may be covered by the brewery or whoever owns the building, so you’ll only usually have to worry about this cover if the building is yours. However, if you’ve made any improvements to the property – for instance if you’ve fitted a new kitchen – it’s worth considering insurance for tenant’s improvements as this may not be covered otherwise. Similarly, you may want to cover against damage, loss or theft of any of the pub's fixtures, fittings and furnishings – as well as your personal belongings if you live on the premises. Contents insurance can include cover for tools and equipment, stock and goods in transit – so be sure that you consider all items that could be at risk, and purchase cover accordingly. If you have to temporarily shut down your pub – for example if you are affected by a fire - a business interruption policy can help to cover the costs of any ongoing overheads, and may also cover any revenue lost during closure. This cover isn’t something that all brokers talk about, and it may not always be available if you choose to buy online. However, it is deemed very valuable by both insurance customers and experts in the insurance industry. A landlord is nothing without a licence, so if your entertainment or alcohol license is withdrawn through no fault of your own, loss of license insurance could help cover any resulting loss of profit - or consequent reduction in the value of your premises. If a customer falls ill as a result of eating or drinking at your pub, thereby consuming your product, you may have to defend yourself against a legal claim. Product liability insurance could foot the bill for any legal or compensation costs if you are held liable. What can affect the cost of insurance for pubs? The most obvious way to affect the overall pub insurance cost is to take out the bare minimum level of cover in order to drive prices down, but in doing so you may be leaving your pub and yourself exposed to any number of other unexpected risks. It could be said that the money you do spend is wasted because the risks your business may be vulnerable to simply aren’t covered. It’s recommended that you don’t just focus on trying to get cheapest price you can, but instead compare pub insurance quotes to make sure you have all the cover you need at a price that suits your budget. The size and location of your pub may also have an effect on price – for instance, a small country pub that hosts a few regulars could expect to pay far less than a city centre pub that entertains students. Conversely, if the country pub suffers from a fire it may take the fire brigade longer to arrive than in an inner city – which could increase the amount of damage suffered. These are the kinds of considerations that an insurer may take into account when quoting you. The amount of excess that you pay on the policy can also influence price. If you are prepared to pay more up front in the event of a claim, you’ll usually be rewarded with a lower premium – though problems can arise if you can’t afford to pay the excess in the event of a claim, and your pay out may even be refused. An analysis of your pub and its circumstances is needed in order to quote and cover you effectively. This is because there may be some forms of protection that you are legally required to have in place, and others that you may choose not to purchase, as the risks they protect against may not apply to your business. To get a quote for a cheap business insurance package, get in touch with Make It Cheaper Financial Services. Our friendly insurance experts can help you to decide what cover is best for your business, and create a bespoke policy to fit your requirements, easily and with no hassle. Call 0800 970 0077 today for your no obligation pub insurance quote.